For most of his life Iwao Hakamada had awoken every morning not knowing if it would be the day when word was given and his prison guards marched him off to the gallows. In Japan the machinery of judicial death operates in obscurity, with prior notice of executions given to death-row inmates only on the day itself, and not at all to their families or lawyers. But in March, after nearly half a century behind bars, the 78-year-old former boxer shuffled free into the glare of media flashlights, dazed and disoriented. The District Court in Shizuoka Prefecture, southwest of Tokyo, had finally decided to reopen the 1966 murder case in which it had sentenced Hakamada to death. DNA tests indicated the evidence used to convict him had been fabricated by investigators. The Japan Federation of Bar Associations hailed it as an “epoch-making” decision. They could be forgiven a little hyperbole: it is only the sixth time in the postwar era that a death-row inmate in Japan has had the sentence overturned. Hakamada was driven to a Tokyo hotel, having to stop en route due to motion sickness. He was asked what food he would most like to eat and an abundance of “cake” was duly delivered to his room, where he slept the night and the whole of the next day. The long years of incarceration in a windowless cell have taken their psychological toll: a planned half-hour reception at the Tokyo Bar Association Hall on 15th April was cut to 10 minutes, Hakamada managing just to express his thanks while his 81-year-old sister Hideko, whom he has sometimes failed to recognize, did the rest of the talking. Hakamada had been working at a soybean processing plant when the firm’s director, his wife and two children were found dead with stab wounds at their burnt down house. He was apprehended a few weeks later, as the case unfolded in a familiar pattern – early arrest of suspect by police, extraction of signed “confession”, retraction of confession by accused at trial, then sentencing and drawn-out appeals. It was not until a year after his arrest that the police produced five pieces of bloodstained clothing from the factory that were used as crucial evidence against him (including a pair of trousers that didn’t fit). He was sentenced to death in 1968, a ruling finalized by the Supreme Court in 1980. His lawyers filed for a retrial in 1981. It took 13 years for the District Court to reject the request, 10 for the High Court to dismiss the appeal against the rejection, and a further four before the Supreme Court also turned it down. A DNA test had first been granted in 2000, but methods were not advanced enough to extract a sufficient quantity. Only in August 2011, three years after Hideko had begun a second appeal process, did the court agree to conduct another DNA test. In April 2012 the results showed the DNA-type from the blood stains on the clothing was not Hakamada’s, nor that of any of the murder victims. Such was the continued obstruction by police and prosecutors that it took another two years for the court to reopen Hakamada’s case and release him. This case has reminded me of one that was in the spotlight when I first came to Japan in the 1980s and that became a cause célèbre for the burakumin – Japan’s underclass caste, mention of which is still likely to cause embarrassment in ordinary social circles. Kazuo Ishikawa, an illiterate pig farm worker from this lowest of social strata, had been found guilty of the kidnapping and murder in May 1963 of a 16-year-old girl in Sayama, north of Tokyo, and sentenced to death. He proclaimed his innocence on appeal, stating he had been beaten by police into signing a confession. His appeal was rejected by the Supreme Court in 1977, but his sentence commuted to life. The Sayama Case has spawned numerous petitions and books over the years, but neither they nor the blatant discrepancies between his handwriting and the ransom note – a key piece of evidence – could save Ishikawa from 31 years in prison. After his release on parole 20 years ago he began the fight to clear his name, and now aged 75 is still fighting, emerging occasionally into the public eye as his defense team awaits a court decision on a third appeal for a retrial that it filed in 2006. It is common knowledge in Japan, if not elsewhere, that the country’s judicial system is based on police acquisition of written confessions during unrecorded interrogations. Hakamada’s chief lawyer during his trial, Hideo Ogawa, has said this method of treating suspects has not changed since the 17th century. Trial conviction rates are absurdly high – a figure of 99 per cent is often quoted. 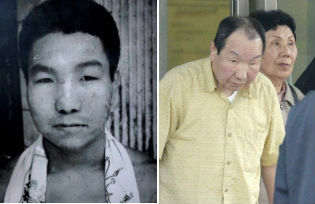 A recent editorial in The Japan Times highlighted the fact that police and prosecutors remain opposed to recording interrogations, still not legally mandatory, citing the well-known Ashikaga Case in which Toshikazu Sugaya spent 18 years in prison over a 1990 murder on the basis of a forced confession, before DNA tests proved his innocence. He was later cleared at a retrial notable for the fact that the prosecutors themselves admitted the police had extracted his confession by torture. But it is with another boxer wrongly convicted of murder in 1966 that Hakamada’s case strikes a poignant parallel. Rubin Carter, who died on Easter Sunday at age 76, had spent 19 years in prison before his release in 1985. “To live in a world where truth matters and justice, however late, really happens – that would be heaven enough for us all,” he wrote in a piece for the New York Daily News in February. Friends of Hakamada who have visited him in hospital, where he is now recuperating, report him as saying simply “I’m free”. If it is all he can articulate, perhaps it amounts to the same thing. For all the fanfare over Hakamada’s release, and the World Boxing Council’s awarding him an honorary championship belt, no Japanese troubadour is likely to immortalize him in song as Bob Dylan did for the “Hurricane”. As with Ishikawa, his fight to clear his name is set to be a long one: to the outrage of his lawyers but to no one’s surprise, no sooner had Hakamada set foot outside the Tokyo Detention House than prosecutors announced their appeal against his release, ensuring any retrial will be delayed even further. Last year Japan executed eight people, two of whom were preparing to apply for appeals. According to Amnesty International, 130 remain on death row. It is impossible to tell how many are there because of police coercion or corruption. The public remain – or are kept – detached from an issue given little critical scrutiny in the media. Meanwhile the cogs of Japan’s criminal justice system grind on in their tortuously slow and tragic-comic way, and Hakamada is unlikely to be judicially absolved in his lifetime, if ever. A life destroyed, with those responsible remaining hidden in the system, never themselves to be held accountable.